Interests:Bible Study, Teaching God's word. I was asked by my pastor why I study eschatology (end times events.) Ignoring the negativity of a challenge like this, I find that "end times events" are tied in with almost everything I read in scripture. Ezekiel 38 and 39 is such an event, as it speaks of a horrific situation that may happen at any minute. Try opening a conversation about what you find in Ezekiel 38 and 39 and the eyes of your audience will glaze over and you can watch them begin to look at their watches, wondering if there isn't somewhere else they need to go. There are reasons behind this lack of interest, and they stem from confusion; a lack of understanding; the inability of the speaker to put flesh and blood on the characters; and, the worst part is that there is a veil over the eyes and ears of the hearer so that they cannot comprehend. Along with those factors, there is a multitude of answers as to who the players are and when this event will take place. Ambiguity plays a role in the disinterest because an honest dissertation of an end-times scenario will typically put you in the ballpark, perhaps even provide the audience with the team name, but at this point, I am not sure we specifically say who the main characters are. Furthermore, two simple sentences can inspire books of commentary. I am going to try and condense but still give you an understanding of this prophecy. He was a priest, the son of a priest, and he was taken captive into Babylon. Already, you should be thinking, odds are not in his favor. Ezekiel was one of the few that give us precise dates. According to Dr. John Gill's commentary, chapter 38 gives an account of "an enemy of the Jews, under the name of Gog, that shall invade their land, and disturb their peace after they are settled in it;"
J. Vernon McGee, in his commentary, demonstrates some classic old-school thinking as he tells us the theme of Ezekiel 38 is Russia's invasion of Israel. McGee is making his case for Gog to be Russia. I happen to think McGee's assessment is wrong and we should not be focused on the Russian President Putin. You have to keep in mind what was going on in the world that would have inspired the McGee's particular emphasis on Russia in his commentary. For example, The United States was deeply entrenched in the Korean war; the Vietnam conflict, with the cold war with Russia waiting just around the corner. I too assumed that Russia would be one of the major players (and no doubt they are, but we are trying to think biblically while paying attention to the context.) as we lived with the verified threat of Russian missiles 90 miles off our coast in Cuba - a Russian ally, as children. I know, every generation has had those that have said, "we are in the last days," and I would tell you that they were right. Now how would I come to the understanding that every generation comprehended that we are in the last days? Daniel chapter 9, spells out a seventy-week decree against Israel. Sixty-nine of those weeks have been fulfilled. The seventieth week of years (7years) has been on hold for over 2000 years. Therefore, we, the church, have been in the last days for over 2000 years. Peter, on the day of Pentecost, filled with Holy Spirit, preached to the thousands milling about the streets of Jerusalem that day. An aspect of what Peter said came from Joel chapter 2 which speaks about the time of God's wrath which the seventieth year portrays. However, within that period, people are acting out in the power of the Holy Spirit as the prophets of old did. Peter said this part of Joel's prophecy had been fulfilled in your hearing. What did he say? We are living in the last days. Note how the passage provided has no appropriate punctuation at the end. That is because the thought continues and we will pursue that shortly. But for the moment let's dissect the verses. Is there any question as to whom the Lord is talking? The answer is Ezekiel. this person also happens to be the chief prince of Meshech and Tubal. A demonic operation that controls a people group? As I try to understand, I turn my attention to my concordances and look up the word Gog. Strong's concordance merely adds Gog, the name of an Israelite. The KJC keeps us in Ezekiel with one exception: 1 Chronicles 5:1-4 MKJV And the sons of Reuben, the first-born of Israel (for he was the first-born; but since he defiled his father's bed, his birthright was given to the sons of Joseph the son of Israel, and the genealogy is not to be counted according to the birthright; 2) For Judah prevailed among his brothers, and from him came the chief ruler, but the birthright was Joseph's); 3) the sons of Reuben the first-born of Israel: Hanoch, and Pallu, Hezron, and Carmi. 4) The sons of Joel: Shemaiah his son, Gog his son, and Shimei, his son. The dishonor carried by the family due to Reuben's indiscretion, which excluded them from any rights of birth, surely plays a role in all of this. He is pictured as a great enemy against God's people. Ezekiel 38:9 NASB "You will go up, you will come like a storm; you will be like a cloud covering the land, you and all your troops, and many peoples with you." He is from the land of Magog or possibly "from the land of Gog." The Lord sets Himself against Gog (Eze_38:2). Gog will lead a coalition of nations against God's people who are then dwelling securely in the land of Israel (Eze_38:14-16). With the addition of the words, God's people who are then dwelling securely in ...Israel. They have turned this so that we are looking at the church and not Israel, which is incorrect. But God, in fact, will bring Gog forth and will destroy him and his people. The Lord spoke about this through other prophets (Eze_38:17-18). Ezekiel 38:17 MKJV So says the Lord Jehovah: Are you he of whom I have spoken in former days, by the hand of My servants the prophets of Israel, who prophesied in those days and years that I would bring you against them? Ezekiel 39:11 CJB " 'When that day comes, I will give Gog a place there in Isra'el for graves, the Travelers' Valley, east of the sea; and it will block the travelers' passage. There they will bury Gog and all his horde, and they will rename it the Valley of Hamon-Gog [horde of Gog]. As you read the information, consider where Gog might come from. It may help you to understand more clearly how the Turkish "president" Recep Tayyip Erdoğan might best fill the role of Gog. Here is was I gather so far. Gog, from the disinherited family line of Reuben, moves North and becomes a nomadic mounted and warring nation known as the Scythians. They ranged into China, Siberia, Egypt, Asia Minor and as far south as the Northern African nations, however, they seem to be centrally located around Turkey and the Caspian Sea. They are heavily influenced and integrated by the surrounding nations such as Persia, Syria, and the Caucasus regions. They conquered Nineveh, the Assyrians, and the Medes. Having relations as violent as Genghis Khan one can assume that slaughter was their general theme. This is the people that God sees as one of Israel's few remaining thorns in the flesh. I'm with you here for the most part. I have read a bunch of the same sources as well as few webpages. It was most interesting listening to some imam's talk about Ma'juj and Ya'juj. So yes, Sythians and Kazars probably are the nearest descendants. What is intriguing is the description of the accoutrements of the MOUNTED army: "and shall set on fire and burn the weapons, both the shields and the bucklers, the bows and the arrows, and the hand staves, and the spears,", " horses and horsemen, all of them clothed with all sorts [of armour, even] a great company [with] bucklers and shields, all of them handling swords: 5 Persia, Ethiopia, and Libya with them; all of them with shield and helmet", "all of them riding upon horses, a great company, and a mighty army...as a cloud to cover the land;"
This is a vast army, an immeasurable cavalry, with shield, bow, arrow, spears etc,. What nation has such an army? None that I know of. I suppose some nations have cavalry but not in the numbers required for the fulfillment of Ezekiel 38-39. If this is an end of the age battle between a cavalry and the nation of Israel the mounted force must be large indeed to come against mechanized warriors. There did exist at one time, and I suspect it still does, a large nomadic tradition in the Eurasian steppes. This people group ranged from the Danube to Mongolia and are likely the descendants of Magog, through the Kazars and the Scythians and as you said, are diverse through integration of many peoples. Could it be Russia as well? I suspect so, even as Russia is not the definitive answer. Another consideration that would add to the descendants of the line of Magog through the Scythians are the people of Siberia. No one knows how many brave generations of harsh climate in the great white north, but there are some and I suspect it's a great many more than any of us realize. I think these peoples may satisfy this, "of the north quarters," which can be read as 'recesses' or 'extreme'. No place so extreme as the frozen recesses of Siberia. I see it as all of the above. An area bounded by the west coast of the Black Sea, the Caucasus, Iran, and Afghanistan in the south, the Pacific on the east, and north to the Russian seas. Anyway, you have at least one interested audience member! What a breath of fresh air your reply was. This is not what I typically get. I too have had some of the same questions and concerns. To merely say I will leave that question to God alleviates my stress but does not answer questions, and I believe the answers are out there. I think scripture says that Satan is loosed to deceive the nations including Gog and Magog. Your take would have Satan deceiving himself. Soooo....no, Satan is not Gog. "I think scripture says that Satan is loosed to deceive the nations including Gog and Magog. Your take would have Satan deceiving himself. Soooo....no, Satan is not Gog." Rev 20:7-8, "...Satan will be released from his prison and will come out to deceive the nations that are at the four corners of the earth, Gog and Magog, to gather them for battle;"
Again, no. Satan deceives the nations, which are Gog and Magog, and gathers them for war. Israel is living in false security (Ezek. 38:11). Look at Israel today. It does not live securely. Only a deceptive peace treaty will fool them into doing so. God refers to Gog as “you are the one of whom I spoke in former days through my servants the prophets of Israel, who prophesied in those days for many years that I would bring you against them” (Ezek. 38: 17 NASB). This can only refer to the Antichrist, and the Antichrist only arises and attacks Israel at the Midpoint of Daniel’s 70th Week. God states that he will rain hail, fire, and brimstone on the forces of Gog. (Ezek. 38:22) This only occurs during the First Trumpet judgment. This time stamps that event as occurring at the beginning of the Seventh Year of the 70th Week of Daniel. After God defeats Gog and his army, God feeds them to the birds of the air (Ezek. 39: 17-20). This is an exact match with Rev. 19: 17 -18 where God calls the birds to gather to feast on the bodies of the Antichrist forces after the Battle of Armageddon. God calls Gog’s forces a cloud that covers the land which is a match with God’s description of them in Joel 2:2. After the battle, the Jewish captives are released and brought back to the land (Ezek. 39: 25-28). This happens after the Battle of Armageddon, and cannot happen prior to that point according to all the other pictures of the 70th Week that we have studied. This passage also claims that from that day forward, God will not allow a single Jew will be left behind in the nations. This is rock solid evidence that this can only refer to the end of the 70thWeek. After this battle, God will not let his Holy Name be profaned any more (Ezek. 39: 7). This can only happen at the conclusion of the 70th Week of Daniel. It is utter nonsense to believe that this can apply to a time before the 70th Week. After the Battle, Israel knows the Lord is God from that point on forever (Ezek. 39: 22). Again, this can only happen at the conclusion of the 70th Week. God announces that this “is the day of which I have spoken” (Ezek. 39:8 NASB). After the battle, God pours out his Spirit on Israel (Ezek. 39:29). Finally, in Ezek. 38: 19-20 we learn that Jesus is physically present on the earth. As we have seen all of these aspects can only be fulfilled at the conclusion of Daniel’s 70th Week and at no other time. For all these reasons, the battle of Gog of Magog can only be the Battle of Armageddon, and Gog can only be the Antichrist. This is important, because in this passage, God’s Word clearly identifies the armies and Kingdom of the Antichrist. God was an actual kingdom with a king, (with a realm or location, with subjects, a royal court, a castle or mansion, etc. ), all the fixings of what we all commonly know in this earth as a kingdom. But I was wrong. We were wrong. Christendom was wrong and still is. Question: What is Jesus Christ doing? This 'kingdom' is not the same as the kingdom of heaven. This kingdom (of heaven) does have a king, a realm, a court, subject, etc. The kingdom of God is Christ. Christ is righteousness, peace, and joy... all the deific attributes of Christ Himself. And flesh has inherited Christ as Promised by God to His people Israel, and spiritual Israel. And this is our inheritance as named souls that were contemplated by God in Trinity in His Mind BEFORE He created heaven earth and man. His Elect people were written in a 'book' of life of the lamb slain from [BEFORE] the foundation (creation) of the world (Rev. 13:8). The unsaved who are not named in the book of life of the lamb slain... a.k.a., the world, CANNOT RECEIVE Christ. No way, no how. So, there are two groups of people on the planet, always has been: those in Covenant with God, and those not in Covenant with God. Joy = the Holy Spirit. If you prefer, you can look up the following verses in your own Bible, of by whatever means and in whatever version you choose. Somebody did a drone video whilst on holiday in Israel:where is it now?! I was﻿﻿ trying to look for a video somebody had taken when they had been on holiday to Israel, I noticed that George has posted some videos from his drones from﻿﻿﻿﻿﻿ Israel but sorry , it wasn't George, it was somebody else and I can't find that video anymore. I didn't get a chance to watch it when I first came across it. Learn from this and have pleasant feelings. Remember this - I read this. My pride is mainly vanity which is the least of the types of pride. And this - Realising and addressing the problem of pride is the main step to becoming humble. Consider if you too - I am isolated but I still do well to try and be humble and listen to other people before I speak about myself lots. Are you like one of the celebrities on TV? No, it's not that bad but only say that if you are in despair about it AND DO squash your pride at every cost. Praise Jesus and magnify him instead e.g. if you have vain imaginations then imagine Jesus as a powerful and beautiful warrior. Being humble feels pleasant as Jesus gives you grace when you do it. IF you don't then you will feel like a turkey. Ezekiel 38: 5-12. Part 2 – I am against you Gog. As a quick disclaimer: I have seen your replies and clearly some of you have a heart for God. Others, spend far too much time listening to the doctrines of demons. Know this, unless they block me I will not quit. I write for a world that is filled with people with a heart like mine; one that has learned to err on the side of mercy. Have a great day basking in the love of Jesus Christ our soon coming King. Having addressed who or what Gog could be in my previous post, we now look at the directive given to Ezekiel to prophecy against Gog (from a great distance, and through time,) about what God's plan is, for the last days. Ezekiel 38:3 NASB and say, 'Thus says the Lord GOD, "Behold, I am against you, O Gog, prince of Rosh, Meshech and Tubal. Eugene Peterson's “The Message” gives us this, “Be warned, Gog. I am against you. Ezekiel 38:4 CJB I will turn you around, put hooks in your jaws and bring you out with all your army, horses and horsemen, all completely equipped, a great horde with breastplates and shields, all wielding swords. Why would verse four be immensely significant in the Jewish mind? If you think back to the story of Jonah you remember that Jonah was asked to prophesy against Nineveh and tell them their days were numbered. While that might seem appropriate, especially if you had an intense hatred for the Ninevehites and wanted them dead because they were sadistically cruel and bloody people. But Jonah also knew something about God that most of us miss, and that was that God's nature was one of mercy. The other thing that Jonah understood was that the Ninevehites were a part of the Assyrian nation, just as Gog is, and they had the nasty habit of dragging their victims back to their lands by putting hooks in their mouths, among other places. Another piece of insight for you. Having recently gone to the beach to be with family, I took an ice chest of cold drinks. I dragged that chest from the car, across the beach sand, and now, later in the day, I was dragging it back again. By the time I got to the stairs that lead up to the car, I was exhausted. I could feel the full weight of the ice chest as I went up the first step. Suddenly it got lighter. I actually thought I was going to turn around and see an angel. What I saw was the long-haired young man whom I had just passed carrying a skateboard. My wife, who was about 22 meters behind me, saw the skateboarder and internally had said, Lord, that would be great if that young man helped my husband. With that, the young man stopped, turned, and began to help me without saying a word. You see, God has ways of his will without a word being exchanged; and, the young man, he probably thought it was his great idea. In one of my posts on Ezekiel 38, I went into great detail about the people of that region, the Scythians. One of their claims to fame is that they were skillful horsemen and deadly with weapons as they rode. Would Ezekiel have known that? It is highly possible as the line of descendants that produced these people existed long before Ezekiel did and he would have learned this through oral history. At this point, I only wish to say, that someone attempted to challenge my previous assertions about Gog, saying, Gog was Satan. Based upon verse four alone is that probable? Not likely seeing as 1Chronicles 5:4 shows us the lineage of a man named Gog, a descendant of Reuben – the disinherited son of Jacob, but then, Ezekiel's prophecy and the actual occurrence of these events spans well over two thousand years and no one lives that long. The only other thing that has credence is a demonic spirit/ fallen angel that carries that name. In this battle coming against Israel, who are the players? Ezekiel 38:5-6 NASB Persia, Ethiopia and Put with them, all of them with shield and helmet; 6) Gomer with all its troops; Beth-togarmah from the remote parts of the north with all its troops-many peoples with you. Ethiopia – At one time Ethiopia was known as Cush. Put - Put is the Libyans. While Qaddafi may have been a wild man, since his removal the nation has turned into a violent Muslim nation. Gomer - Sits squarely in modern day Turkey. Beth-togarmah - This was territory from which the Medes emanated. It is the region in which the Armenians resided. At one point in time, the Assyrian nations bordered Beth-togarmah, and it is the Caucasus region between the Black Sea and the Caspian Sea. While Russia has dominated these people at times they seem to be independent of Russia while maintaining civil war amongst themselves. There is a strong clue embedded within the verse that says, “in the far reaches of the north, with all its troops-many peoples are with you." Again, this is the Scythian region and one of their claims to fame was Genghis Khan. Ezekiel 38:7 CJB Prepare yourself, get ready, you and all your crowd gathered around you; and take charge of them. Consider something here. Ezekiel is writing this while he is in Babylonian captivity; which for him, began around 570 B.C. Now, over 2570 years later, God is finally bringing this collection of assailants together for a horrendous battle. A battle, that for Israel, will look impossible. Many will add another war in here, the Psalm 83 war. Some even insert it before the events that Ezekiel lays out before us. Psalms 83:3-8 ISV They plot against your people and conspire against your cherished ones. 4) They say, "Let us go and erase them as a nation so the name of Israel will not be remembered anymore." 5) Indeed, they shrewdly planned together, forming an alliance against you— 6) the tents of Edom, the Ishmaelites, Moab, the Hagrites, 7) Gebal, Ammon, Amalek, Philistia, and the inhabitants of Tyre. 😎 Even Assyria joined them to strengthen the descendants of Lot. Interlude. Psalm 83 has similarities to what we see in Ezekiel 38 and 39, but what I don't see is Cush, and Put – Egypt and Libya. I am not sure those nations can be excluded as the descendants traveled extensively. Ezekiel 38:8 CJB After many days have passed, you will be mustered for service; in later years you will invade the land which has been brought back from the sword, gathered out of many peoples, the mountains of Isra'el. They had been lying in ruins for a long time, but now Isra'el has been extracted from the peoples and all of them are living there securely. Far too many read this and think it merely means weeks later. This phrase, like “the prince that shall come,” that is defined for us in Daniel 9:26, has several encroachments into history. The problem is, these intrusions are spread across thousands of years. Many is the Hebrew word rab meaning much, many, numerous, and abundance, among others. Verse eight is clearly a description of Israel. Sudden and overwhelming. Are all storms sudden? No, in many cases people will say, this is storm weather and it always starts like this. So, the implication is that we have a strong probability of knowing when this will come. Just today (6/29/2018), through the MEMRI website, I learned of a Middle Eastern newspaper that leans heavily toward Erdoğan, publishing an article calling for the Muslim of the world to gather in Jihad against Israel (this article was published in Dec of 2017 – not that long ago. 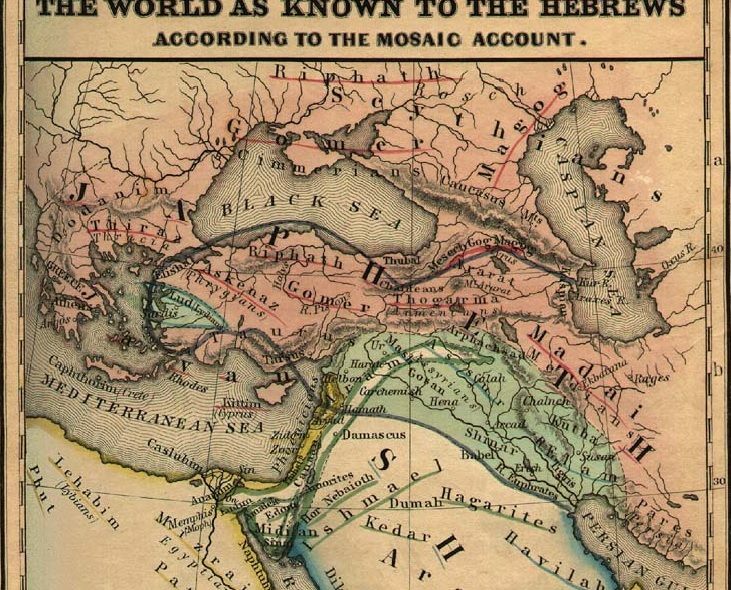 An aspect of the article was a map which showed Israel surrounded on every side with army tanks. Surrounded on every side sounds very much like Ezekiel's words. “you will be like a cloud covering the land.” - Clouds are formed by thousands of drops of water. We are told that the number seems innumerable. “you and all your troops, and many other peoples with you.” - These are people of a like mind – Muslims may not be unified in “religion” but they all seem to understand the idea of Jihad. Ezekiel 38:10-12 CJB "Adonai Elohim says: 'When that day comes, thoughts will well up in your mind, and you will devise a sinister scheme. 11) You will say, "I am going to invade this land of unwalled villages; I will take by surprise these people who are at peace, living securely, all in places without walls, bars or gates. 12) I will seize the spoil and take the plunder." You will attack the former ruins that are now inhabited and come against the people gathered from the nations, who have acquired livestock and other wealth and are living in the central parts of the land. “ When that day comes,” - Question, does God do anything at random? The answer is NO, as everything is part of a precise and well thought out plan; a plan which includes giving man a free will and the opportunity to choose life or death. Regardless of the optional qualities, the plan is still in place and intact. So, is it possible that God would leave the option for Gog to design and plan out “his” own destiny? Not a chance and verse ten is no different, as “that day” is entirely in God's hands, and, a part of God's plan. Another consideration is the terminology “that day.” The phrase is attributed to several events; one of which is the return of Jesus as the warring and conquering Messiah, who also fights a bloody battle in the Jezreel Valley; there is the great white throne judgment and the entirety of the seven-years of God's wrath upon the earth. Are any of those events what we are looking at here? I do not believe so as there are always other events associated, which we do not see here. The Hebrew word for thoughts is dāḇār and literally means words. I could read this when that day comes, words will pop into your head, you are going to think this is your sinister scheme, but in reality, you will be doing what I have planned all along. Mind is the Hebrew word lēḇāḇ and also means heart. In God's understanding, the heart and the mind are one in the same. Devise is from the Hebrew word châshab and means to weave, fabricate, or plot. The context of Deuteronomy 3:5 is applied to Israel's conquer of Og, the King of Bashan. Having destroyed Og's fortified cities they were never rebuilt by Israel. It also demonstrates that cities were typically fortresses; this is not what you see in Israel today. Deuteronomy 3:3-6 NASB "All these were cities fortified with high walls, gates, and bars, besides a great many unwalled towns. Zechariah 2:4 NASB and said to him, "Run, speak to that young man, saying, 'Jerusalem will be inhabited without walls because of the multitude of men and cattle within it. I like the way the ISV version translates Ezekiel 38:12, “the people … who live at the center of the world's attention.” Currently, all the world seems to be looking at Israel, once again. Whether Israel is at the center of the world or not is debatable, but God is making that nation the center of attention. And, although we have not covered the verse yet, it sums up the reason behind all this tumult. Ezekiel 38:16 ERV...I will bring you to fight against my land. Then, Gog, the nations will learn how powerful I am! They will learn to respect me and know that I am holy.